What can a document sorting out ruling class differences 800 years ago be used for? David Carpenter’s Magna Carta with a New Commentary is a book about documents, which is both its glory and its downfall. William Blackstone. 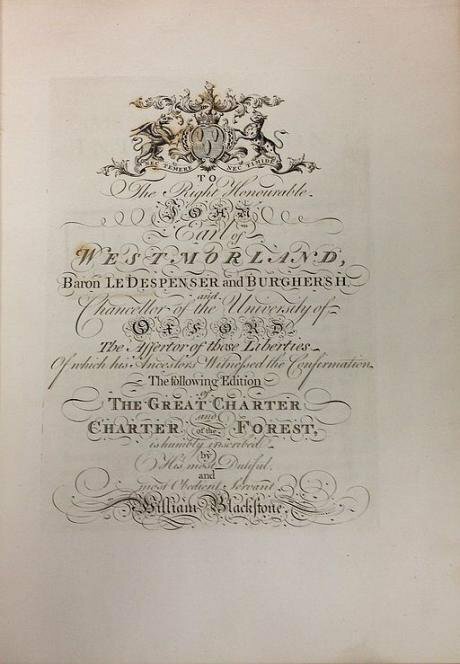 The Great Charter and Charter of the Forest (1st ed.,1759, dedication). Wikicommons. Some rights reserved.“No free man [homo liber] shall be seized or imprisoned, or stripped of his rights or possessions, or outlawed or exiled, or deprived of his standing in any other way, nor will we proceed with force against him, or send others to do so, except by the lawful judgment of his equals or by the law of the land,” says Chapter 39 of Magna Carta. It put King John under law. It should do the same to government now. And, with an eye to the future and interpreting even more deeply, those last two phrases might lead to law that comes from equals and law that begins with land, not the state. A phrase from chapter 7 of Magna Carta, “… and she shall have in the meantime her reasonable estovers in the common,” introduces us to the principle of the commons which should become the material basis of our economies of equalization based on land. The principle of the commons arises in two places in the bundle of charters known together as “Magna Carta.” One is in chapter 7 of Magna Carta (1217) and the other is the Charter of the Forest (also 1217). Despite appearances – nearly 600 pages, a glossary, a translation, a bibliography, two appendices, notes, an index, a map – this book is not the disinterested, a-political, monumental, scholarly tome it seems. You won’t find “estovers in the common” in these pages, and little on the Charter of the Forest? How can this be? David Carpenter is a professor at King’s College, London, and a prominent scholar serving on the Parliamentary 800th anniversary committee. His father was canon of Westminster Abbey. He provides us with a kind of scholarly apostolic succession which began in 1968 with him listening with one or two others to John Mason’s lectures in the chapter house of Oxford cathedral. Mason learned from Sir Goronwy Edwards who was taught by T.F. Tout “who in turn had been taught by Stubbs himself,” the Victorian Regius Professor of History and Bishop of Oxford! There is an unintended Monty Python element to this book, with Magna Carta replacing the holy grail. 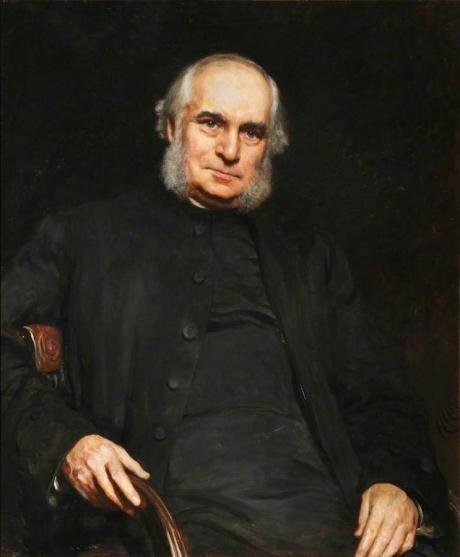 Portrait of William Stubbs by Hubert von Herkomer in Bodleian Library (1885). Wikicommons. Some rights reserved.Also in the 1960s C.F. Holt published a scholarly book on Magna Carta. Carpenter sent him a list of errors, and Holt responded with a postcard pointing out one of Carpenter’s mistakes (on the date of the death of King John). Thus do scholars quibble on. I among them, for I recommend that you search out William Morris’ account of John’s death, coming as it does from the folk knowledge of fourteenth century peasants. Although Carpenter nods to “the rule of law” he is not really concerned with fundamental law as was Edward Coke, the jurist who opposed the Stuart kings, nor with natural law, or even customary law. He quantifies key words in Magna Carta such as “kingdom” (21 times) or “land” (ten times) or “England” (14 times) - but if you were to quantify “rule of law” in his book I doubt it would much exceed two or three. King John was a cruel man, drowning his own nephew, Arthur, with his own hands. He starved to death Matilda and her eldest son. So “desperate was the mother that she had eaten her son’s cheeks.” John was one of the “Norman banditti” (Thomas Paine) who claimed the forests as their own. These forests were in twenty of England’s counties covering one third of the kingdom. The King and his foresters squeezed the people of the forests, and these malpractises caused rebellion. “The Charter was above all about money. Its overwhelming aim was to restrict the king’s ability to take it from his subjects.” Thus all the provisions about various royal taxes and levies, such as tallage, aids, scutages, amercements. The King wanted money to make war. Carpenter does not venture into the European wars and global commerce as part of the impetus behind the centralization of the state. Instead, the description of the medieval economy relies on time-tested clichés – “rise of population,” “age of expansion” – yet he will say that it is impossible to generalize. England had a population of perhaps three and a half million people, nine-tenths of whom were peasants of whom two-fifths were unfree (villeins, serfs, bonded) and three-fifths free (rustics, cottagers, sokemen). “It offered nothing to the unfree peasant,” yet this is not quite true because the Forest Charter explicitly says no one shall suffer loss of life or limb for forest offences. By this account, the book is about several thousand knights and about a hundred barons and earls who spoke French. This is a book about documents, which is both its glory and its downfall. We must distinguish the interpretation of documents from the interpretation of history. Like Jean Mabillon or Marc Bloch, students of medieval charters in the seventeenth and twentieth centuries respectively, the medievalist must be expert in chronology, languages, philology, epigraphy, and handwriting. The interpretation of documents involves authentication, verification, preservation, translation, collation, and exegesis. In contrast, the interpretation of history brings in philosophy – materialist or idealist, determinist or voluntarist; it brings in rhetoric - a grand narrative or random stories; it brings in politics too - top down history or history from bottom up. These other interpretations employ other types of evidence: oral history, the evolution of plants and animals, archaeology, stones, tools and weapons, material artefacts of all kinds, song, poetry, even dance and body movement, Antarctic ice, radio-activity, all these open windows into the past. For medieval history, trees were the milieu of life. Without other such sources we are bound to a kind of scribal solipsism. Still…. There is delight in watching a skilled medievalist at work, we are invited so to speak into the workshop of someone who loves his craft, and Carpenter loves Magna Carta as text and artefact. We deal with a bundle of documents such as engrossments, copies, and confirmations. 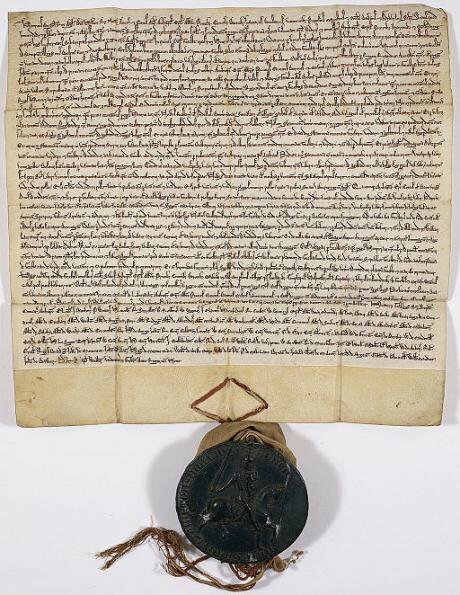 The charter sealed in 1215 was a peace treaty concluding a civil war between King and barons, at least temporarily. The sequels were several, 1216, 1217 which contained some amendments, and 1225. Carpenter writes, “The texts of the 1225 Magna Carta and the Charter of the Forest became definitive.” He calls the 1225 version “the final and definitive Magna Carta.” After the confirmation of 1300 two charters, the Charters of Liberty, became the first law published in England’s Statutes of the Realm. 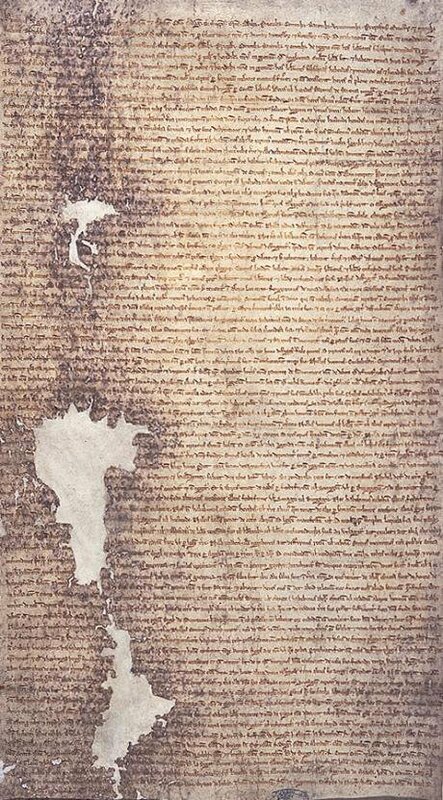 The 1225 version of Magna Carta issued by Henry III of England. Wikicommons. Some rights reserved.Of the 1215 charter four engrossments survive and at least thirty-four copies. There is but a single surviving engrossment of the 1216 charter and no copies. Four engrossments of the 1217 charter and twelve copies survive, and four of the 1225 charter and twenty-three copies. The copies are found in cartularies, chronicles, and statute books and these are found in abbeys, priories, cathedrals, castles, and estates. Then there were confirmations in 1265, 1297, and 1300. As for the four engrossments of 1215, two are preserved in the British Library, and the others are in Lincoln Cathedral and Salisbury Cathedral. They are written on parchment of different sizes, one of 86 lines another of 54. It would take about eight hours to write one out. It was written in Latin and translated right away into French (the language of the rulers). It wasn’t proclaimed in English until 1300 and not written in English until the sixteenth century. Forest Charter, 1225. Additional Charter, British Library. Wikicommons. Some rights reserved.The choice made among all these documents determines the outcome of interpretation. The Charter of the Forest is largely excluded, and the emendation to chapter 7 made in 1217 concerning the widow’s reasonable estovers in the common – rationabile estoverium suum interium de communii - is absent altogether. Because of this omission the principle of the commons cannot be extracted. “Estover” does not appear in this book, not in the glossary, not in the commentary on chapter seven, not in the index. These are serious flaws, and they rupture the historical continuity of interpretation – of Coke in the seventeenth century, Blackstone in the eighteenth, Stubbs in the nineteenth, MacKechnie and Holt in the twentieth century. This is disappointing. The gloss on estovers takes us to an ecological history of English woodlands and their human uses. These depended on social class. They may be taken away, they may be restored. A strength of Carpenter’s interpretation is its emphasis on reparation (return of the forest) and the right of resistance. Forest rights or customs were subject to negotiation, and generations of local and social history in England have contributed to that chronicle; it is a local and a popular endeavor going back to the Robin Hood ballads and including the twentieth century schools of social history. To those common rights or customs we would add those mentioned in the Charter of the Forest, chiminage, herbage, pannage, and the government of them through the swanimote courts. Assarts were bits of land cleared from the forest for arable uses. Purprestures was forest land taken for buildings. Chiminage was the right to use roads without paying tolls; herbage, the right to put cattle or sheep to graze; pannage, the right to put pigs in the forests for mast. An economy which was not based exclusively on money or commodity production could be built up from such customs, a collection of common customs. “A merchant has merchandise, a rustic his wainage,” i.e., the seed, the ploughs, the plough team, the grain in the stalk. Economically speaking, we might call them the means of production. Without them the peasant could not be taxed, for he or she would have produced nothing to tax! Magna Carta refers to wainage in chapters five and chapter twenty in translations of the 1215 charter, but not in the translations of the 1225 charter. Can this concept not be employed in the struggle against Monsanto and ‘Frankenstein’ foods? It depends on the willingness of lawyers, advocates, barristers to make the argument. It depends on judges accepting the type of argument. It depends on legislators backing it up. These in turn depend upon the movement of those possessing seeds and who have a stake in their integrity. These people are the indigenous cultivators, from Bangla Desh to Chiapas. The world’s seed plasm is in their hands. This surely is the gloss we need to put on “the commune of the land,” a powerful phrase which Carpenter extols as a constitutional notion rather than the material reality it ought to become. Coke referred to the two charters as “two glorious Lights.” One of these lights is put out. Like Macbeth, Carpenter is “cabined, cribbed, confined, bound in”; he has allowed the 1215 charter to enclose his view. Maitland wrote that Magna Carta was caught between “theoretical sanctity and practical insecurity.” Yes, he wrote at a moment of high imperialism and glorification of the Anglo-Saxon race. Yet people of color leading national liberations, Gandhi, Mandela, and Sun Yet-Sen appealed to it, against empire and racism. Let us say rather that it is caught between a totem of propaganda and a political text of potentiality. As of late February 2015, when I consulted the website of the quasi-official Magna Carta Project I was pleased to read “this project represents a work in progress. It is currently not complete and the material is subject to change.” The same may be said of Magna Carta - a work in progress, subject to change. 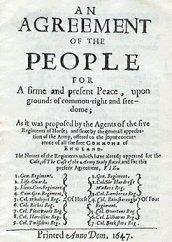 Agreement of the People, from the Levellers (1647-1649, United Kingdom). Wikicommons. Some rights reserved.To say that each rested on a “mistake” depending on the 1217 or 1225 charters, while true, is pedantic, if not pettifogging, because it omits the human struggles that produced new interpretations - the English Revolution of the 1640s, for instance, or the American Declaration of Independence, or the abolitionist movement against slavery, or the struggles for national liberation. Our own epoch is one against privatization and the ideology of neo-liberalism. Opposition can be conducted in the name of the commons, that is, of subsistence for all. That is the framework of current interpretation which will necessarily be disestablishmentarian, i.e. not part of the Establishment of church, monarch, and money. Can a document sorting out ruling class differences 800 years ago be used in the necessary project of abolishing the ruling class altogether? The master’s tools cannot dismantle the master’s house, says Audre Lorde. Perhaps she is right. We must develop tools of our own. Meanwhile, how would we use this inheritance? We need to address the commons as a solution to our own needs, for water, air, land, fire, and (as we must add) mind. We want equalization, or the abolition of the economic class system of exploitation. We need a different conception of property, neither State nor individual, and a different conception of ‘man’. Magna Carta gave us homo liber, or “free man”; Carl Linneas gave us homo sapiens, or “wise man”; E.P. Thompson spoke of homo economicus, or “economic man.” Our era of privatization has produced another ideal historical species of man, one opposed to the commons, and deriving etymologically from the Greek work for private, I mean homo idioticus. He is idiotically polluting the air and waters, engrossing the land and forests, and creating misery in his ceaseless, selfish accumulation and wars of drones. The book ends with a similar global trope with which it began, the jet airplanes of Heathrow. A soaring piece of rhetoric, as the deafening noise of the jet engines roar over the meadow, but also an unfortunate piece of rhetoric. The Americans have taken over Runnymede getting it wrong with their little rotunda, as it is not ‘freedom under law’ as they say on the granite, cylindrical plinth in the meadow but the king, and the thing bears the single star, symbol of the US Air Force. The least the committee could do is to destroy this ugly symbol, and if it doesn’t who will?